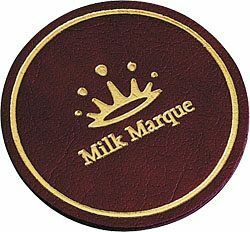 Manufactured in genuine British leather, these round leather promotional coasters are sure to do wonders for your brand image. The coasters feature a luxury flocked backing and are foil blocked with your logo. Select from budget busting PU Vivella (modern material manufactured in a combination of polyurethane and pressed fibre which makes for a great low cost alternative to leather) to the finest quality Tuscana Luxury Leather for the truly discerning customer.